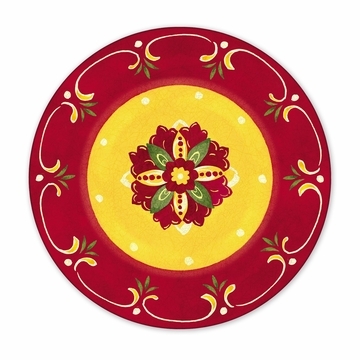 A bright red and yellow pattern inspired by the colors and floral patterns of Spain define the Le Cadeaux Corvo collection of premium-quality melamine dinnerware now on sale at Distinctive Decor. This beautifully patterned tableware collection with the look of delicate ceramic is virtually unbreakable with its premium melamine construction. All Le Cadeaux melamine dinnerware is also dishwasher safe and BPA free. Shop our Corvo pattern collection of plates, bowls, serving platters, two-piece cake platters and two-piece baguette trays. This collection includes four-piece appetizer plate sets, large oval serving bowls and other tableware essentials for indoor or outdoor dining. La Cadeaux dinnerware is a stylish buy for patio dinner parties, yachts, vacation homes and catered receptions.